These are two oils that I am working on, using a different palette and trying to achieve a golden glow through the under painting. The first is a Stony Brook, a place where I keep returning,the second is Lake Ronkonkoma. Both places that we have been to in the summer. Today will be another day on the phone with the Kodak printer people, having problems with the WIFI to print from my ipad. Is all this technology keeping me away from my art, yes, and not to happy about that, but is necessary. Hopefully it wont be an all day event. Happy Painting everyone. I should say, painting while the radio plays Vincent. Always loved that song. This is a study of clouds, so once again it is a wip. Again another tulip painting, just jumped in on this study, the tulips are still hanging in there, tomorrow they will have a different look and some changes will be made, or I might start another study. The art shows are almost here with the spring and summer season approaching the applications and invitation on coming in , hopefully I will have some new work to show. I am taking advantage of the cold weather and just staying home going through my previous plein air and photos. Mike and I are going through cabin fever. He just went out and bought a kitchen floor. What bothers me, is the lack of exercise during these dreary months. Sitting or even standing at the easel isn't enough. We have been to the mall on occasion, but if I am at the mall . I want to shop. So okay, maybe I'll do some housework or laundry. In the meantime Happy Painting Everyone!!! Yesterday was a day of trying to get back to my life without the little ones. It's always difficult when they leave. But time was of the essence, the tulips didn't have too much longer and it was necessary to get back to work. This was a warm up of a quick sketch in gouache on illustration board. Today, it was plein air and time to get out there before the snow melts. Trust me, not in the mood to paint snow but once again time was of the essence. The snow won't be with us too much longer. Mike listened to John Grisham's The Racketeer and I painted from the car, still to cold to go out. I called these little sketches my short hand notes for when I return to the studio. I am also changing my blog as you noticed. My daily journal blog will have my other favorite artist listed on the side bar. I don't want to leave anyone out, there are so many of you that I have a profound admiration for your work. I also wanted to share with all of you, the artist that are listed on facebook. So until then, Happy Painting Everyone. My family will be returning home this evening. Since their arrival, there have been some changes that I have made to my blog. You will notice some of the artist that are listed are very well known, hopefully you will enjoy seeing their recent work. I will continue to remain in contact with all of my fellow bloggers that have given so much support and encouragement to me in the past few years. Tomorrow I will begin some new paintings and with a different approach. In the meantime Happy Painting everyone. The storm, meaning my grand children's visit. Had some extra time today and started work on this 22x28 canvas. I've been wanting to go larger, this canvas was in my art room for years, intimidated by the size and couldn't get myself to ruin a good piece of canvas. Today I noticed that it had been ruined, so it was a green light to go and jump in, and paint, had nothing to loose. This is no where near completion but it is a start. Happy Painting everyone. Today was another day of child proofing my house. My daughter and her family will be here on Friday. So that being said, it is time to break away for a week. Family first , art second. My grandson is 2'/2 and the oldest being 10 and grand daughter will be 8. So need I say what a great joy it is when they visit. I did these 2 sketches, simply because my flowers are dying and wanted to at least get an idea for future paintings in oils. I will probably have to treat myself when they return home. So until I return in about 1 week, Happy Painting everyone. Today was a day devoted to mundane chores of housework. My daughter and her family are paying us a visit next weekend. The mounds of snow are still out there and people on Long Island are stuck in their homes unable to get out. The plows haven't come through and the LIE is closed from exit 57 to 63. No worries, Mike and I aren't about to go out and we keeping busy. I decided to give myself a break and did this little entry in my are journal. These are the little primrose plants I purchased last week. It was fun working in watercolor. Happy Painting everyone. The Blizzard of 2013, came and packed a wallop: 30.2inches for us. Most of the day, did a little shoveling, and Mike used the snow blower. At our age it's a bit scary to be out there and I do love snow. Our neighbor came over to help Mike. In the afternoon I watched my new David Dunlop dvd on skies. I did this quick study, using just linseed oil and 2 blues, white, yellow and red oxide. It was great working with non toxic oil. Tomorrow I will try to get out and paint plein air in the yard, plenty of snow, that will be around for awhile. They say Long Island will get hit hard. Expected amounts of snow between 8 to 16inches and in some places on the Island will get more. While waiting, just wanted to practice painting snow, so I worked from one of my photo's from last week. This was just a 45 minute oil sketch 8x10. Happy Painting everyone. The daffodils made it through the night, hearty little flowers. So wanted to do another sketch from the set up, this time using eggs and a mug. I did take photo's so that at a later date I will do a more detailed painting. The flowers are very abstract, my main interest was capturing the essence of these beauties, rather than a exact description of the flowers. Happy Painting everyone. Today was a day on what to do, while enjoying my plein air work with Mike, the beautiful bouquet of daffodils were calling me, Paint Me First!! Well they were after all handpicked from Ireland, what if they died while we were out. So it was a big mistake, in my desire to capture these lovely flowers it wasn't going to happen. Whenever we have the preconceived notions on how something looks or how they should be painted it always ends in disaster , for me. Because I failed to really see and well that being said. Lesson Learned!! On a positive note: I did paint all day , in which that always brings such pleasure. So no complaints, if tomorrow these lovely little flowers make through the night I will give it another try or simply just enjoy there beauty. Happy Painting Everyone. Mike and I enjoyed a pleasant time at Miller's Pond. Nature is cooperating by treating us with just a dusting of snow. Perfect for the winter scene I wanted to paint. Sitting in the car, Mike listened to John Grisham's The Racketeer and I happily sat there and painted the scene at hand. Everything was so gray and very little color so I warmed up things a bit with ochre's and raw sienna. I did start out with toned canvases which is always a great help to expedite the painting process. Also I used texture paste and gesso mixture , my good friend Vic knows about this technique. After the painting session, which I am very pleased at the progress I am making, simply because the paintings are getting closer to completion while on location. Practice for the plein air of spring and summer. Well after the painting we went to Trader Joe's and we purchased beautiful flowers for possibly painting for tomorrow. I do hope everyone is enjoying these days of February and staying warm and happily painting. 8x10 todays piece from my plein and ipad. passion and desire to learn and to grow as an artist. It's a world of color and tones and wonderment. Using various mixtures of that beautiful gooey stuff we call paint, or just sketching, the medium does not matter, just the act of doing. I thank God everyday, simply for the gift of passion to want to express or seek and simply learn. Happy Painting to all my fellow Bloggers. I was so excited about the snow forecast I kept getting up during the night looking if there was snow. Got up and yes, to a winter wonderland, it was only a dusting, but knew I had to prepare for the first trip out. I collected my guerrilla pochade box and took my paints, brushes, and turps. I was to keep the pochade on my lap in the front seat of the car, as B.S. did and it was great. Mike and I were warm, he read and I painted. Hopefully tomorrow we will go out and paint at Mills Pond, there should be more snow. Today was another day of experimentation, these were color studies. Wanting to post more than I've posted in the last few months, made a promise the I would at least try to get one painting done in the course of a day. Bruce Sherman has inspired me to step up to the plate. Granted not braving the cold just yet, due to my nasty sinus infection, but itching to pull out a pochade box from the collections of boxes from last year. 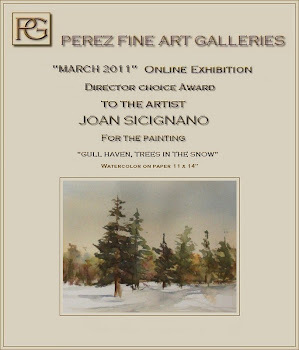 Snow is headed towards Long Island, now, where and when do I attempt my first plein air of 2013. Maybe Gull Haven Golf course or anyplace I can keep the car close by, to warm up.